We have heard all through our lives about the importance of saving and investing for our future. We need savings accounts, retirement accounts, emergency funds, college funds for the kids, and maybe even a rainy day fund. Most of the advice comes from commercials, from banks and brokers and financial advisors who are “experts” and will manage your money, and of course make money from it and charge fees as well. To save for your retirement, you need to invest in markets, in funds and stocks- but then what happens to your money? If the present roller coaster ride is any indication, your hard-earned money will be in for the ride of its life. And there is every chance you may lose it all. If you make hundreds of thousands of dollars a year, investing in “the markets” is surely an option. But for most of us, it isn’t even a consideration. Our money means a lot more to us. Let’s look at the definition of “investment.” Most of us think of stocks and bonds and mutual funds- advertisers have done a good job there. But there are other types of investments that are nowhere near as harrowing, are much more pragmatic, not to mention prudent, and will be there when you need them. These are the investments you make in staying healthy, in maintaining what you have, and preparing to feed, clothe, warm, and protect yourself and your family. Let’s start with a number- say $5000. You can invest $5000 with a broker into a mutual fund. Initially there will be a fee to open the fund and purchase the shares. So you might lose $50 or $100 on the initial investment. From there, who knows what might happen. You might be up, down, or up and down on any given day. Projecting out 10, 20, 30 years or more until you can retrieve YOUR money without incurring another fee, and the outcome is anyone’s guess. And of course $5000 amounts to nothing in today’s economy- you might need to invest that amount every couple of months depending on your age to be able to “retire” and live off the income. Now consider more practical, tangible investments such as storage foods, water purification equipment, precious metals, firearms and ammunition, field gear, extra shoes and clothing, holding on to cash, and last but no least eating healthy and staying in shape so you can better enjoy life now and as you age. In short, it is time to redefine the term “investment”. Not only are these investments useful in the immediate, they are a long-term investment in your future, and an insurance policy all in one. They are part of your 6 month emergency fund. They are in no way superfluous nor wasteful- everything you purchase, every upgrade you make is something you can and should use or enjoy at some point in the future. What else do I consider an investment, and adding to my insurance policy? How about keeping my vehicle maintained and filled with gas, keeping my house maintained, making sure my bills are paid on time, and regular doctor and dentist visits. All of these things are investments in your future, and this is where it all starts. A well- maintained house gives you security; paid bills give you freedom from worry; extra food, soap, toothbrushes, and toilet paper mean if you did lose your job for example, those things are covered. As the new year approaches give this redefinition of “investment” some thought. Think about what you have, how ready you are for an emergency, and how you would feel reallocating some of your hard-earned dollars to more tangible ends. In my last post I wrote a quick review of the book Beyond NATO: A New Security Architecture for Eastern Europe (The Marshall Papers) by Michael E. O’Hanlon. The book argues the case against NATO expansion and presents the alternative of a “negotiated agreement” between current NATO countries, the non-NATO and non-aligned states that would remain sovereign and neutral, and Russia. In a recent New York Times article similar alternative, and conflicting perspectives on NATO are offered, and three more books, two of which I already have on order, are cited. Although the article does not go in-depth into alternatives, it does summarise the authors’ views on NATO and European security enough to make me want to read more. Robert Kagan, in his new book The Jungle Grows Back: America and Our Imperiled World, warns the Europe is in danger and- as far as I can tell- that we must not abandon NATO. Finally, Ivo Daalder and James Lindsay in The Empty Throne: America’s Abdication of Global Leadership take the middle ground- that if America steps back, Europe must rally to fill the gap. These books prove to be some very interesting reading. No matter the perspective of any of the authors, I am certain that the separation and potential power vacuum caused by isolationism, nationalism, and populism would send Europe on its’ path to destruction. NATO is an instrument of security and must remain such, until something equal in structure and quality replace it. Allowing NATO to crumble would be like me removing the locks from my front door, which is not something I would consider in the 21st century. As a follow-up to my recent post on the Balkan wars of the 1990’s, I felt it was time to add more book reviews for those who might be interested in immersing themselves in the issues facing the Balkans and eastern Europe. With the future in mind, first on the list is a recent (fall, 2017) edition from the Brookings Institution titled Beyond NATO: A New Security Architecture for Eastern Europe (The Marshall Papers) by Michael E. O’Hanlon. In summary, the book argues the case against NATO expansion and presents the alternative of a “negotiated agreement” between current NATO countries, the non-NATOand non-aligned states that would remain sovereign and neutral, and Russia. The catalyst for this new type of security agreement is Russia, and namely Russia’s fear of NATO and the west uncomfortably approaching, and eventually encroaching upon, its borders. The author does cause the reader to step outside the western view that our intervention in eastern Europe, most notably Bosnia, Kosovo, and Ukraine, even when labeled humanitarian, can be construed as threatening when viewed through Russian eyes. The premise is that the new security architecture would act as a deterrent to Russian posturing and aggression and its plans for military growth, including nuclear weapons. It is believed that the coalition of neutral states, not overseen directly by NATO or the United States especially, will eventually allow Russia to cease their destabilisation efforts in the region, specifically in Ukraine and Georgia, and allow these and other states such as Armenia and Azerbaijan to develop towards normalcy after being able to turn away from a continuous defensive/offensive posture. While theoretically possible, the concept relies on Russia’s acceptance of the new structure. Whether or not Russia accepts, and if so, their willingness and ability to remain faithful to the agreement, is a different story. There would be a built in “range of responses” to different threats against the agreement participants, be that Russia or other nations. These responses could include anything from economic sanctions to expedited NATO membership for threatened agreement participants. Street art in Mostar, Bosnia and Herzegovina, October, 2017. Note the artists use of a bullet hole for the left eye, obviously the starting point for the image. Seasons in Hell: Understanding Bosnia’s War by Ed Vulliamy was published in 1994. At that time the siege of Sarajevo had ended, Serbia and its forces understood that the UN and NATO would actually take decisive action against them, and the concentration camps, mass murder, atrocities, and genocide of the war in Bosnia had been exposed to the world. Vulliamy’s book reports what was known at the time of publication and paints an ugly, demented picture of what was perpetrated on so many innocent people by the Yugoslav army/ the Serbian army, by “paramilitaries”, by criminals and thugs. But he also tells stories of hope, heroism, and bravery, of fighting against all odds, and of how so many of the people of Bosnia endured. Interspersing these stories in a book of this nature is absolutely necessary, lest the sickened reader cast the book aside. If you choose one book to help your understand the war in Bosnia, Vulliamy’s book will painfully, yet clearly meet that goal. The following blog is a re-post from one of my other sites. After some thought, I decided it was appropriate to re-post it here. The focus of the post is something that we all should think about carefully- civil war, genocide, and murder. If we think that it can’t happen again, we are wrong- it has and it continues to happen. And if we think such things could never happen here, we should be very careful about that thought. Part of being prepared is being informed. Knowledge of history, ancient and modern, can help us better process the overwhelming amount of information coming to us from all around the world today. Knowledge of history can help us prepare in case the same events begin to happen closer to home. My family and I have just returned from another trip to the Balkan countries of Croatia and Bosnia and Herzegovina. The highlight of the trip was my time in Bosnia and Herzegovina, and especially in the capital of Sarajevo, my first visit there. Truthfully, using the term “highlight” is problematic at least, considering the focus of my visit. In Bosnia and Herzegovina, and Sarajevo I visited the Museum of Crimes Against Humanity and Genocide, I rode the tram back and forth down sniper alley, and walked the entire way as well, I visited cemeteries, and towns where the mass killings took place, stood on the hills above Sarajevo where the shells were lobbed on the city, and visited Gallerija 11/07/95, dedicated to those murdered in Srebrenica on that day. Quote on the wall of the Galerija 11/07/95. 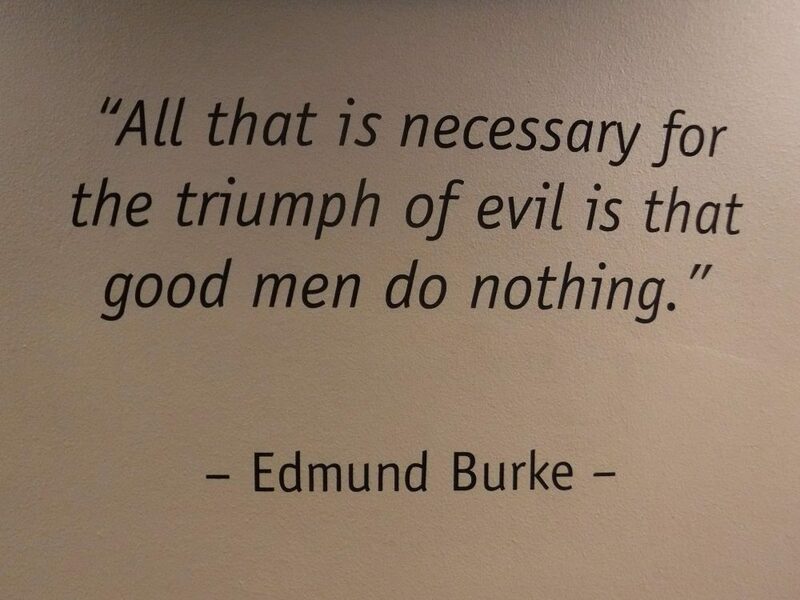 It sums up the painful exhibit on the atrocities that took place in Srebrenica quite well. With that said, Sarajevo is one of the most interesting places I have been in my life, and most of my time in Bosnia and Herzegovina was spent there. A week seemed so very inadequate for developing an understanding of the country now and in the past, the people and cultures, its multiple overlapping and parallel histories, and most important of all, the recent events that are so prominent, were prominently ignored, and are prominently forgotten by most of the world today. It was enough time to be introduced, and to create along list for my next visit. I have been following events in the Balkans since the late 1980’s, have read extensively about the history of the region, have visited the region before and have family from there. Still, no amount of knowledge can adequately explain the terror that swept the Balkans and the suffering of the people there in the 1990’s, nor answer the questions of why it happened, and most important, why it was allowed to happen. My visit to Sarajevo turned out to be largely about trying to understand just that. I am not sure that I understand it even now. Of course, from a historical perspective, or a psychological perspective, or as a social scientist one can break it down any number of ways, to simple cause and effect, and technically understand what happened. But from a Human perspective, it just doesn’t make sense. 11 July 1995- Srebrenica massacre- the UN declared “safe zone” is abandoned by the UN soldiers protecting it, leaving many of the 20,000 residents at the mercy of the Serbian army. Some residents are evacuated with the UN, others escape on foot to Bosnian-controlled areas, but some 8,000 are captured and murdered by Bosnian Serb General Ratko Mladic and his troops. This is the biggest, but one of many such incidents of inaction- of abandonment and murder repeated around the country and region during the 1990’s. 28 August, 1995- the second Markale Market massacre, in which 37 people are killed and 90 wounded, becomes the final straw in the siege of Sarajevo. UN General Sir Rupert Smith- who essentially could no longer tolerate standing by and watching the killing- initiated airstrikes on Bosnian Serb artillery positions around Sarajevo on that very day. This action effectively ended the siege of Sarajevo, which lasted for over 1400 days, and signaled a change in the way the UN, NATO, and the world at large addressed the Homeland War, as it is known in the Balkans. 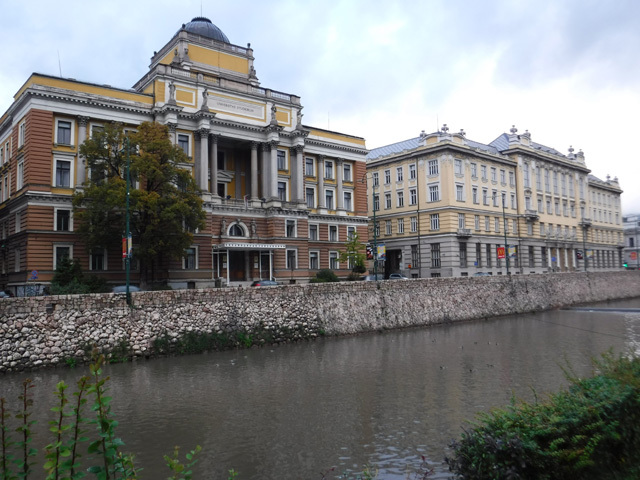 Two Austro-Hungarian style buildings along the River Miljacka-the law school and post office. Both are beautiful examples of the architecture style and both are repaired and represent the new face of the city today. The city of Sarajevo is beautiful, full of life, vibrant, engaging, and inviting in so many ways. It is considered to be literally where east meets west- with the Ottoman empire to the east, and Rome and Austria to the west. The mix of cultures and history, the food, coffee, sweets, the churches, mosques, minarets, the art and architecture, and of course the people make Sarajevo a city like no other. Seeing it today, walking the streets, visiting its monuments, sitting at its cafes drinking coffee, one might never guess what it looked like 20 years ago after being under siege for over 1400 days. Seeing images of the city then, and standing in those very places now- something I made it a point to do- was absolutely mind boggling. Revisiting the city through wartime images made the past even more poignant. But still, it was almost unbelievable considering the city as it is today. 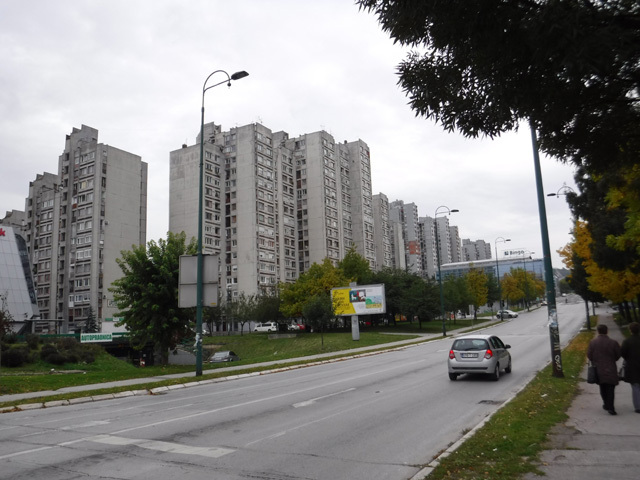 Communist-era highrises along “sniper alley”, on Zmaja od Bosne Street, Sarajevo. These buildings were used by snipers during the conflict, ending up without any windows and full of holes from return fire. Many of the repairs, even 20 years later, appear cursory. Holes from small arms, rocket, and tanks rounds are still visible up and down the street and throughout the city. There are countless resources for learning more about the Balkans, the former Yugoslavia, the Homeland War, and the region today. I cannot say enough about the importance of understanding what happened there- learning about it might just prompt us to pay closer attention the next time that murderous political regimes are preparing their campaigns of genocide and torture. Clearly the UN faltered in their mission in the former Yugoslavia. Whether or not that would have been different in today’s world, with social media, instant communication, and- I hope- a growing awareness to the world around us, is pure speculation. But from where I sit there are plenty of other possibilities for this to happen again. And to be more to the point, that same has happened again, and is currently happening- just open the newspaper and you will find the same stories of chaos and murder, the same images of destroyed cities and fleeing refugees reported as a normal, daily event. The question is whether we continue to let it happen, and most importantly, what do we do to stop it. In today’s complex world, with all of our knowledge and power, decisions to act are no less difficult to make than they were in the 1990’s. And with global repercussions to those decisions looming around every corner, taking action to liberate the oppressed puts us everyone more at risk every day, making those decision even more difficult. 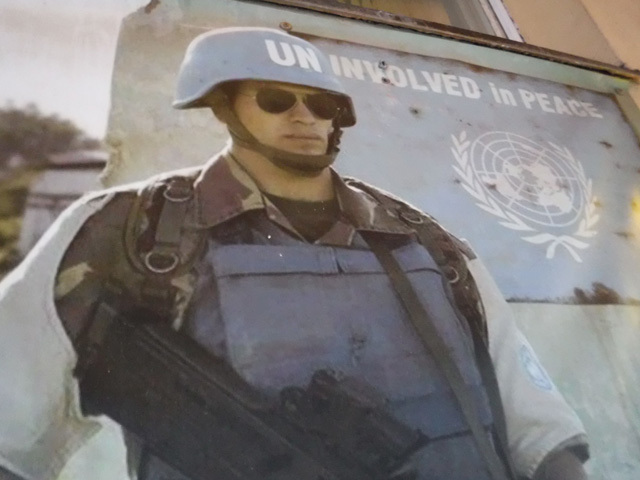 An image taken in downtown Sarajevo- the large poster was displayed in a prominent enough location and states clearly how many in the city felt- and feel- about the UN’s role there. For all its beauty, tensions are still high in the city and the region for countless reasons. Finally, here are a few links to specific pages on the ICTY website that explain the tribunal, those who were on trial, and to Wikipedia on the fall of the Soviet Union. The final trial, that of Ratko Mladic, was recently completed. The verdict will be released soon at which time the ICTY will be disbanded. Former Bosnian Serb commander Ratko Mladic has been sentenced to life in prison. Reports state that he was “fighting” till the end, being disruptive, and flew into a tirade before the verdict was read. He was convicted on 10 of the 11 counts against him, more than 20 years after the fact. In an interview on the BBC a survivor of Srebrenica pointed out that it would have been more fitting, more prudent, and certainly more meaningful had the verdict been handed down 10 or 20 years ago. Either way, justice has finally been served. Read more about the verdict at the Radio Free Europe website. For full information on the trial, see the International Criminal Tribunal for the Former Yugoslavia website. If you are unfamiliar with the Bosnia and Herzegovina, the Balkans, the former Yugoslavia and the war they endured there after the fall of the Soviet Union, see my recent post for some background. This is a re-post from my Desert Explorer Blog. I posted it there first as a follow up to similar topics I have written about. It seems appropriate for this blog as well. If we are not fit and healthy, we are at a serious disadvantage in all that we do- and that certainly applies to being prepared. Read on and stay healthy. I know this is a departure from my usual post topics of the desert, gear, trip reports, and archaeology. In a sense it is a belated follow-up to a post of a few years back about going gluten-free and making other changes to my diet. As someone who has been going for my entire life, who never stops moving, as a runner, a hiker, biker, backpacker, and so on, my health and fitness define my life. Diet is an inseparable part of that health, fitness, and lifestyle. And so, this post. To recap what prompted some pretty drastic changes to my diet, a few years back I started experiencing allergic reactions to certain foods, or so it seemed. The reactions were in no way life threatening, but more of an annoyance. I decided immediately to make some changes- no more gluten, soy, peanuts or dairy other than occasional hard cheeses- more recently I have cut out grains and all added sugars as well. Since then I have felt great- and often realised that I have never felt better! But once again some of those reactions started to show up. I visited my medical doctor who within seconds of my describing the symptoms was already talking about drugs and allergy tests. Since I went to her without any expectations of help, I left in the same mindset- that change was up to me. I immediately went back to doing more research and found that intestinal permeability was a very likely cause of the reactions. And probably had been all along. Yes, it seems to be another “trendy” problem; intestinal permeability is up there with being gluten free, fermented vegetables, and paleo diets. But there are times when trendy things make sense, when data support the trends we follow. All of a sudden, everywhere I looked, every book I picked up, every person I talked to told the same story. Intestinal problems seemed to be affecting everyone. I felt very disturbed at this development, both because it affected me, and because I found myself asking what kind of a world we’ve created where we readily accept and eat “food” that is toxic and is killing us! But the eternal skeptic in me understood that we live in a time of producers and consumers. We take what we are fed…at least until we can’t take it any more…. Back to diet and health. As the symptoms returned a book showed up at our house. My son read it first, and would not stop talking about it. It covered so many of his interests- World War II resistance fighters, guerilla warfare, Greek mythology, edible wild plants, diet, exercise, parkour, and natural movement. So I had to read it next. I was immediately so engulfed that I couldn’t put it down. Not only did it convey so many things I really needed to read about, it sent me off in other directions which were equally important to my current research. First published in 2015, Natural Born Heroes is written by Christopher McDougall. The book is centered in Crete during World War II, but it is so multi-dimensional, so full of adventure, and leads in so many other directions, that it will appeal to just about anyone. McDougall introduces the reader to the Cretan resistance during World War II, to the local sheep herders who became guerilla fighters when they needed to, to operatives from Churchill’s Ministry of Ungentlemanly Warfare, and to how they fought together and used the natural environment as part of their strategy to win. So, how does this relate to my health? Natural Born Heroes by Christopher McDougall- another starting point for me in my quest for a healthy, active life. The author, an athlete and ultra-runner, talks extensively about diet and how it relates to the ability to endure physically. He introduces the paleo diet, the Maffetone Method (more on that in the future), and sugar-free, meat and vegetable based eating. There are so many other topics he delves into- “health as heroism”, the importance of interaction with nature, the history of natural movement, diet and evolution, fat as fuel, the myths of cholesterol and carbo-loading, and the menace of sugar- that there is no way I could cover it all in a blog post. I suggest reading the book! It was another starting point for me, helping take my health to another level. Next on the reading list is a book about autoimmune conditions. More fun reading, which I will write about soon. In the meantime I’ll be running every day and enjoying my health. For more on our adventures- most of which take places in the Utah desert- visit the Desert Explorer website. Our economy is stable and those running it are benevolent and care deeply about all of us. If you believe that, there might be some investment land waiting for you in the swamps of Florida. The graph below is from the FRED website, the Federal Reserve Economic Data database of the Federal Reserve Bank of St. Louis. In the graph, the decline began in the early 1980’s, during and after the Savings & Loan scandal, largely perpetuated by Neil Bush, of the Bush monarchy. You might ask the question, “with all the bank closures, why does it seem like there are still so many banks?” The answer comes in the now-common phrase “too big to fail.” For more on that, see Neil Young. Small, failed banks, and even larger ones (see JP Morgan-Chase– the largest bank in the U.S.), have been consumed and taken over by the massive multinational banks whose names are now all-too familiar to everyone. Some economists argue that this is how free enterprise and the economic system works, that inefficiency is replaced by efficiency and that the market corrects itself. This is true when there is no government intervention. As soon as there is intervention, the notion falls on its face- read about the The Austrian School of economics for more on that. Bailing out the too big to fail banks not only caused the self- correcting market to fall on its face, it bashed its head in from behind with a 2 by 4 first! Bank Closures over time- 1984-2016. So, what can we do about it? That should be the question on everyone’s mind. Whether you believe it or not, your money counts. And when I say “your money”, I do not refer just to the money you have in your savings account. The data says that very few of is have any of that anyway! What I am referring to is what you use as money- your home mortgage, your car loan, your credit cards, and of course your checking and savings accounts. When you have these accounts at Chase or Wells Fargo or Bank of America, you are helping perpetuate the unjust system that will destroy our Republic and eventually all democracy. Sound harsh? Do the research yourself- prove me wrong. Good luck with that. In the meantime, close your account at Wells Fargo, and open one with you local credit union. Close your Chase credit card and… just don’t use credit cards any more. Truly, this is the smartest move, but it is unrealistic in today’s world. Do some research about which credit cards are more socially responsible and go from there. And my final recommendation, instead of putting money away in a savings account that makes you nothing and the bank 5 or 6% interest, keep the money close at hand and safe. If your savings account is your “emergency fund”, how will it serve you in an emergency if the bank has closed its doors when you need it? Put the money under your mattress, preferably in the form of precious metals. But no matter what, do something! Don’t just sit there thinking someone else is going to save the world. If you do, you’ll end up with our economy- face down in the dirt. There was a time when currency came in the form of silver and gold coins. Later, in the 1800’s, once paper currencies became the norm, the value of the paper was still backed by precious metal in the form of gold in countries agreeing to this standard- the gold standard. The gold standard included the agreement between the countries adhering to it that currency in circulation within countries accepting the standard could be exchanged for their face value in gold. England adopted the gold standard in 1817, and the US officially did so in 1900 with the passage of the Gold Standard Act. Having the price of gold fixed to currencies insured relative economic stability in countries adhering to the standard. Economic disturbances- production increases, inflation, increase in demand- in one country were in a sense buffered in other countries, keeping prices and economies stable throughout the world. Interestingly, during World War I when countries abandoned the gold standard, inflation became rampant. This was by design- without the international gold standard governments are able to manipulate their countries’ economies- for better or for worse. Again in 1971, when the US officially abandoned gold standard, we saw rampant inflation. Of course there are seemingly infinite other factors influencing the world economy today that would take lifetimes of study and writing to explain, especially in our ultra-complex, globalised, digital world. But suffice it to say that currencies backed by gold or silver created more stable, self-regulating, and prosperous economies around the world. Today, January 1st, 2017, the current price for an ounce of gold is about $1,150 USD, an increase of over $1,100 from its 1971 fixed price. The price of gold has been higher, and of course much lower, but generally rising over most of that time to its present cost. Ups and downs occur, but gold remains a tangible, valuable asset that should not be overlooked. For current prices, making purchases of metals, and a great radio program, visit the Patriot Trading Group. They are an honest, hard-working company who will answer your questions and help you make the right purchase. Parents, family, teachers, our local community leaders and so on are role models for children and young adults as they grow. As adults we continue to find and look up to figures that represent how we would like to live, do business, models of who we want to be. The United States government can be viewed as a parent that takes care of nearly 320 million children. Our parent is nearly 20 trillion dollars in debt- that is just over 60,000 dollars for each and every person in America. The personal debt per capita is not much better- just over 54,000 dollars. I would advise that we try not to follow our parent’s fiscally irresponsible model, but we citizens are not far behind. View the debt clock here, with extensive breakdowns from many different financial sectors. See our post on Preparation and Debt to help get a handle on your own debt and spending. I recently picked up a copy of the book The High Security Shelter – How to Implement a Multi-Purpose Safe Room in the Home by Joel Skousen and Andrew Skousen. The book covers everything from creating a small storage area in the back of a walk in closet, to creating a hidden safe room in the back of a garage, to converting an existing basement into a full size, long-term shelter. The Skousens discuss storage areas, cooking, water storage and filtration, electricity, bathrooms, sleeping spaces, air filtration, and many other related topics. There is an appendix which lists recommended products and services, including websites and other contact information. There is even a section called “Preparedness and Stockpile Lists”. Best of all are the actual drawings- elevations and plans, of everything from closets to full size shelters, including “furnishings” such as bunk beds, tables, and storage areas. The drawings give basic layouts, sizes, and ideas for single person and family size shelters. I will use them as a basis for my own drawings, adapting and changing them to fit my needs and current ideas. The book is a great place to start if you are wondering about what can be done to enhance your security, whether it be a place to store a couple of firearms and ammunition, or a long-term shelter for your entire family. There is so much to be considered when it comes to food storage that it can stop a person in their tracks. Even the thought of trying to explain the process in one blog post is daunting, but I will do my best. Start with your notebook, and a budgeted amount for storage foods. I mentioned the notebook in another post. I have mine broken down into sections, one if which is food. There I have my needs broken down further by the place I will buy them. How did I calculate the amount of food I need? Good question. There are plenty of websites out there with static charts, and even some that will calculate based on age and number of people, how much food you need for a given period of time. I recommend the various food guides put out by the LDS church as a simple place to start- see the 3 month list specifically. Finally- and don’t worry about this now- I have a spreadsheet that has monthly goals in it based on my budget and including my entire shopping list for the year. For example, January’s needs might consist of a bucket of dried soup mix from Costco, a cash allowance for “the mattress”, and extra filters for the Big Berke. You can just lay this out on paper, by month, once you have an idea of your budget and what your priorities are. First, storage foods come in different forms- there are foods from the grocery store- both canned and dry, then bulk food- larger amounts of things such as rice and beans, then foods specifically designed for storage- sealed buckets, bags of freeze dried or dehydrated food, and MRE’s. The obvious benefit with this category is the ability to tear open a package and eat, or only needing hot water for the meal. Then comes seeds and gardening, storage of foods you’ve grown, and drying and canning. There are recipes for cooking stored foods to consider. Storage food recipes can be very different from typical recipes for fresh foods. And how will you cook you foods? I recommend starting simple- canned goods, one pot foods such as pasta, oatmeal, or rice. As you expand to more complex dishes you will need more ingredients and the means for cooking them. Don’t forget to consider the amount of water you will need to cook, and clean up afterwards. Last there is the question of where and how to store your foods. I store canned goods in their original, flat boxes. I use 5 gallon food grade buckets with Gamma Seal lids for bulk items such as rice, flour, and sugar. The buckets sit on the basement floor, everything else is on wire shelving. There are a few basic rules that should be applied when stocking your pantry. First, buy foods you usually eat- don’t plan on trying new foods or new recipes when you are in a less than optimal situation. And don’t purchase foods just because they are a good deal- don’t buy 50 pounds of inexpensive, dried parsley unless you really like dried parsley. As part of your preparation you need to cook with the foods you are buying, especially if you are buying bulk dried beans for example, and have never cooked them before. All stored foods should be dated and rotated out as you purchase newer goods. Remember the first rule- buy foods you usually eat- this is how you keep your pantry fresh. The simplest way to start your preparedness pantry is to purchase extra, non-perishable foods the next time you go to the grocery store. Look for canned foods that are on sale- this is one way to move yourself along with your purchasing. Do your regular shopping, but if you spot something you normally use and it is on sale, add it to the pantry. You can use this method to supplement any lists you have come up with. If you have a Costco membership you have a great resource for large packages, canned goods, and bulk items. They offer plenty of storage foods online as well, 5 and 6 gallon buckets of everything from dried beans or vegetables, to pallets full of buckets to keep a family fed for a year or more. Most of these have a 20 or 25 year shelf life. Be careful though, make sure you try the meals you buy before you invest in multiple buckets, or a pallet full. Read the ingredients list for the bulk items or meals you are considering, especially if you are dealing with allergies or a limited diet. Many storage foods are relatively healthy, but many contain preservatives, or excessive sugar or salt. Read the reviews on the foods as well- there are usually plenty of them. Having a supply of food on hand for an emergency just makes sense. Don’t wait till something happens to start planning and preparing- do it now. Any advanced preparation you make will be helpful, if not essential to survival some day. Even if you don’t have time to make a detailed plan, a budget, or shopping list today, at least start stocking up. When “it” happens (fill in the blank yourself for the “it”), you don’t want to be standing in a breadline, or searching grocery store shelves only to find them empty. We’ve all seen plenty of images of these unfortunate people in recent months and years- make sure you don’t become one of them. New posts are sent by email.